Solo accordion player for hire. 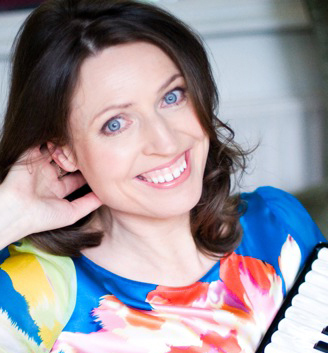 Colette O'Leary is a highly respected piano accordionist as she combines breath-taking virtuousity with a genuine love and feeling for the music she plays. Colette is one of the best at coaxing genuine sounds from the stomach Steinway, a sterling musician. 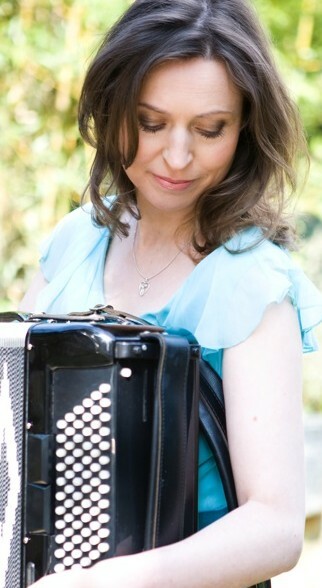 Colette O’Leary is a highly respected piano accordionist as she combines breath-taking virtuousity with a genuine love and feeling for the music she plays. She weaves an intriguing tapestry of music from Ireland, Italy, France, Eastern Europe, Argentina and Louisiana with zest, vitality and cosmopolitan taste. Colette was born in the highly musical area of Sliabh Luachra in Co. Kerry in the south west of Ireland. 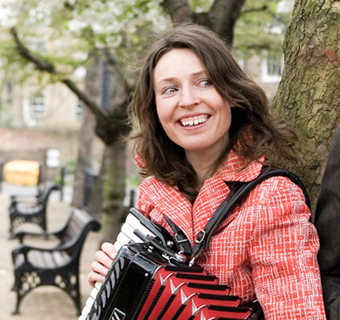 Her musical career began at the age of five when she took her first piano accordion lesson. By the age of eighteen, she had won two All-Ireland titles. In 1992, Colette moved to Galway in the west of Ireland. This was to be a huge turning point for her. In this vibrant town of world music culture, she teamed up with harpist Laoise Kelly and mandolin/banjo player Mary Shannon to form the highly acclaimed Bumblebees. In 1997, they released their eponymous debut album receiving ecstatic reviews from the critics. It was subsequently voted one of the top ten albums of the year by Hot Press. They forged an excellent reputation for themselves performing at festivals world-wide, Celtic Colours Canada, Tonder Festival Denmark, Milwaukee Festival USA and the prestigious Celtic Connections Festival Glasgow to name but a few. “Bumblebees combine outstanding musical prowess with a collective spirit and joie de vivre that is truly captivating” (Celtic Connections). In 1999, they released their second album “Buzzin'” which was voted one of the top 20 albums by US reviewer Earle Hitchner (Wall Street Journal and Irish Echo New York). The release was followed by heavy touring schedules which included England, France, Italy, Austria, Germany, Holland and Denmark. “The aptly named Bumblebees produce music of great style and considerable accomplishment with effervescent good humour and wit” (Nuala O’Connor, Irish Times). Their most recent performance was for her Excellency Irish President Mary McAleese in Dublin Castle on the occassion of the Latvian President’s first trip to Ireland. In 2001, Colette moved to London. Since then, she has toured and performed with singer-songwriter Mark Nevin (Fairground Attraction) in UK and Australia and with blues singer Mary Couglan (UK and the The Fleadh, London). She has just recorded her first solo album “The Attic Room” featuring guest vibraphone jazz maestro Roger Beaujolais.